Peel and chop pineapple into pieces. 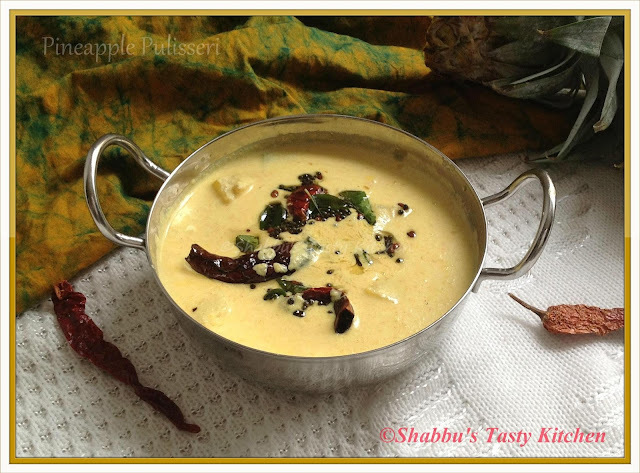 Grind grated coconut with cumin seeds, green chillies, 2-3 curry leaves and 1/4 tsp turmeric powder to a fine paste. In a pan, add the pineapple pieces and cook it adding chilli powder,1/4 tsp turmeric powder,salt and little water until it turns soft and tender. Add the ground coconut paste to the cooked pineapple, mix well and cook for few minutes on medium flame. Reduce the heat and add the beaten yoghurt , mix well and cook for 1-2 minutes. Don't allow to boil. Heat oil in a small pan and splutter mustard seeds. Add fenugreek seeds, curry leaves and dry red chillies and pour this over the pulissery...Add 1/2 tsp sugar (optional) and mix well.. Serve with rice..